I think I’ve told this story before. When I first started this blog, I didn’t really know what to expect from it, hence the name of “Randoms by a random“. It slowly evolved into a poetry blog with the gradual addition of mental health advocacy through the series “Mental health Friday”. I always wondered how people wrote flash fictions, little did I think I would be one of those who wrote them as well, all thanks to Flash fiction for aspiring writers weekly challenge. This blog has been an adventure, filled with so many amazing people. I never would have thought I’d make the lifelong friends I made here. With that being said, I feel it’s time for me to take a break. This was inevitable, seeing that I have been finding it hard to keep up with the blog this year. It’s not all bad though, I do have good news, but you’ll have to wait till the end to find out what it is. I started this blog when I was in my 3rd year of medical school and I am happy to say I have finally gotten my practicing license now, Thank God. And now that I’m done with that stress, and while awaiting the next phase of my life, I’ve decided to try something different. Last month, I created an instagram account, where I will still be posting my poems (@ameena_kg) and for the time being, I wouldn’t be putting up any new posts on this blog. I will definitely come back, but I’ve just been finding it difficult to keep up this blog at the moment. Now, to the big news, I finally created a self hosted website, its called “all things Ameena”, I want to focus on that for now. I wouldn’t post there as often as I did here, as quality not quantity would be the key. It’s supposed to be a lighthearted blog, which chronicles everything Me, with a touch of humor. Do subscribe to that ( and you need not worry, I wouldn’t be blowing up your email with daily posts). I know I have pretty much earned the label of “The queen of AWOL” and as much as I would like to say that I am back blogging full time, I can’t say that at this point in time. Every year comes with its curve ball and this year has dealt more than a couple sucker punches, but that is a blog post for another day. 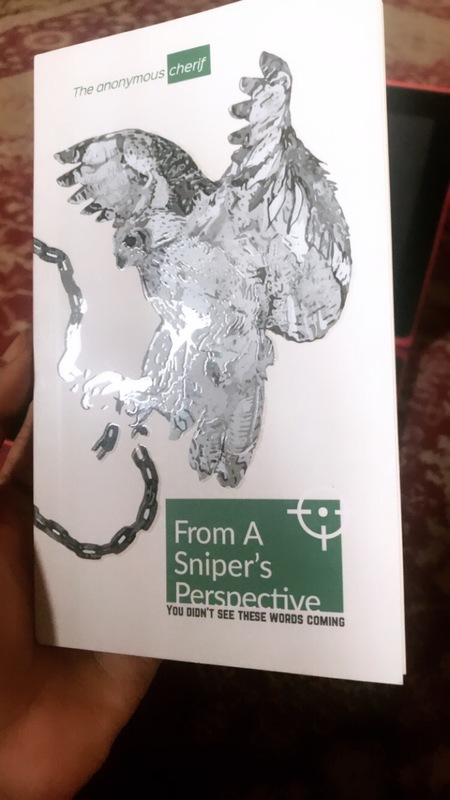 Today, I want to celebrate a poetry book I read last week, it’s titled “From a sniper’s perspective“. The foreword, This book has the most interesting foreword of any poetry book I’ve read so far. It contains a brief review of the entire collection in a few paragraphs, short enough to keep the reader craving more of the poems and long enough, to give the reader an idea of what to expect from the collection and the poet as a whole. The collection begins with life as a Nigerian in poems like “Nigeria as a hundred Naifather note” and “transformed don blow“. Then moves on to other aspects. He talks about how society now is kind of like the “Bishop” in chess game, everyone just moves in and out and no one looks out for one another. This poem is called “persistence of vision“. But of course, unless you are Harper lee and the book is “to kill a mockingbird”, no book is 100% for me. With that being said, A few of the poems in the book especially the prose got a bit complicated for me to grasp the entire picture. I also wish it had a content page, which would make it easier to access the poems I love and of course, it’s a short collection of poetry, so I hope there’s going to be a “from the sniper’s perspective 2.0” in the near future. And he said, “I am fond of you”, just that. Not “I love you”, or “I like you”, He just felt a fondness for me. Something to say he enjoyed being in my company but, He wouldn’t take it any further. For a while, it was enough for me. I couldn’t get the entire cake, so I settled for that little slice, enough to leave a sweet taste in my mouth for a while. But as all things come crashing down eventually, my fantasy did. I realized when you love someone, “fondness” just couldn’t cut it. There’s a little bitterness that begins to form in the throat when you tell someone “I love you”, and they smile and utter, “I’m fond of you too”. The bitterness spread in my mouth and I knew I had to make a choice. It was either him or me. If I choose him, I lose myself. So before my heart could convince me to do otherwise, I ran. Not literally. In the span of a few moments, I deleted his contacts, his pictures, his physicalities, leaving only his memories. His memories… Science had taught me a time will come when they will begin to fade too. Sometimes, you have to love yourself enough to walk away from things and people who put a dent around your heart. It wasn’t my intention to post two Nikki Giovanni poems in a row, but what can I say, I saw the poem whilst scrolling through my poetry album and couldn’t wait till next week, I mean, who knows if we’ll see next week right? the psychiatrists . . . psychologists . . .
Today’s question is from Ingrid. She asks, “What’s your secret to keeping the blog up all these years?”. To be honest, I am surprised that I kept this blog up for all these years. It has a bit to do with the fact that I write the most, when I have a blog. I realized that when ever I take my blogging break (which lasts for months), I write very little. So being aware of that fact, helped to keep this blog going. Also, the response I’ve gotten from the community. Another thing, is the WordPress family in my niche. I have been blessed to have such an awesome community, filled with people who check up on me in my absence , people who welcome me with open arms upon my return and those who encourage me to never put the pen down. The sun refused to shine. Without the rhythm of the winds. And the sky stood empty. If silence was the new “pollution”. And of course the sun arose. And the birds going to and fro. Today.. I know how it feels. Last month was my blogiversary, and I asked you all to ask any questions you want to be answered. For this month, I’d be posting my blog posts with an answer to a question, so keep an eye out for that. Most of the time, I get my inspiration from life. I am not an abstract person, so abstract art and still life art are not my forte. I cant look at an empty cup and easily gain inspiration from that. My inspiration comes from people. I am a very inquisitive person, I love to understand people, why they feel the way the do, why they react certain ways. And if i don’t have answers to that, I find that poetry gives me the freedom to create that. It helps me fill in the remaining pictures of a puzzle. And also, the amount tragedy and sadness floating around becomes too much for me to contain at times, and so writing becomes a way of unburdening. I hope that answers the question. Being a short ended fuse. To make it go away. It is a mean friend. Question 1 (Colin and Ray). He asked: What was the most impactful event (what has influenced you the most) in your life to date? I had to think a lot about this because there’s been quite a few events, but, I ended up choosing one. And this is because, this particular event was what started a spiral for me and that event is “leaving home and going to another country (Sudan) at the age of 15 to start university. The main reason I chose this is because, I know now, that if everything that occurred with me whilst I was in Sudan, had happened back at home, the end results would have been completely different. So moving to Sudan at that particular age and time, made all the difference. Thank you very much For the question Colin. Depending on who you ask.